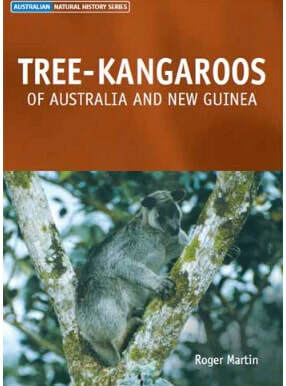 There are 47 varieties of kangaroos. Are the only large animal that moves by hopping. Have strong hind legs and large feet. The tail is used for balance when hopping. Can move at about 40 miles per hour. Eats grass, young shoots and leaves. Can go for months without drinking. Have excellent hearing and can swivel their ears in all directions. Live in 'mobs' of about 10 individuals. Males 'box' either in play or in competition over females. Have a pouch in which their young live. Babies, when born, look like a tiny pink, hairless worm. It makes its way into the pouch and attached itself to one of the four teats. The joey remains in the pouch for 9 months and continues to suckle until it's 12 - 17 months old. 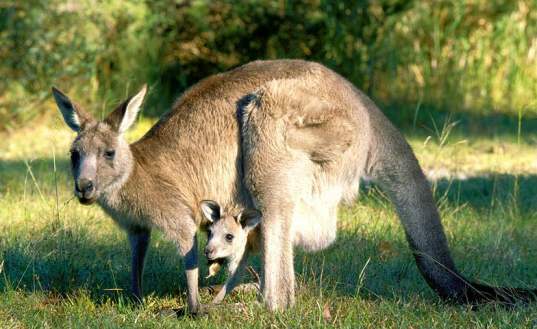 If a joey is frightened, it will jump head-first into it's mother's pouch. Females can produce full-fat and skimmed milk simultaneously. Male kangaroos attract females by showing off their biceps. Almost all kangaroos are left handed. Has thick black and white fur - white belly, black head, back and limbs.